Built on the water and surrounded by a multitude of rivers and canals, not to mention the Gulf of Finland right on its doorstep, St Petersburg is also called the “Venice of the North” as Goethe dubbed it. 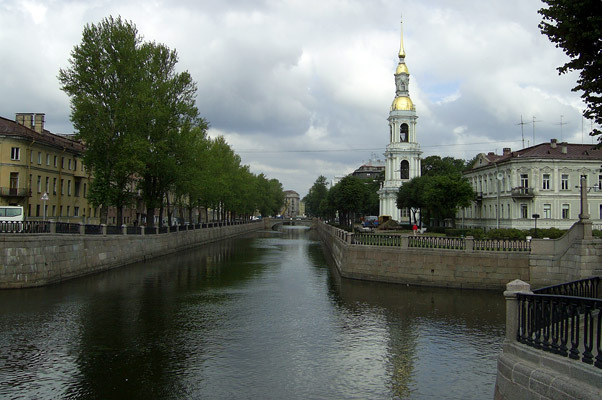 You should know that since the city's foundation, the rivers and canals of St Petersburg have always played a key role. They are used for trade and by military vessels, act as valve to prevent floods, and are used as a way to move from one island to another by boat. Despite the numerous bridges in Saint Petersburg that have been built over the years, today rivers and canals still play a huge role in the city's transportation; plus they have become one of the most popular and best ways to discover the Imperial city. In fact, the most relaxing, fun and easiest way for anyone to explore our Venice of the North is by cruising along the granite vestured rivers in the summer while enjoying the warm and breeze of the day, or much better, a romantic night under the raised bridges and the twilight sky of the White Nights. Many of the city’s most beautiful Palaces and Cathedrals, such as the Winter Palace, the Admiralty, and Peter Fortress, are situated on the banks of the Neva River, Bolshaya Neva, Malaya Neva, Fontanka River, Moika River and Griboyedov Canal, which are the main city's waterways. 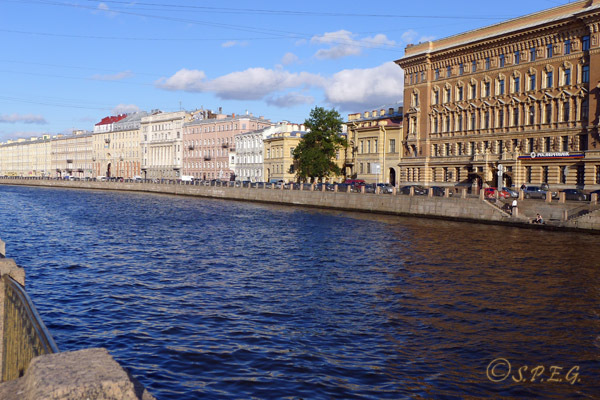 Let’s now take a close look at the main rivers and canals of St. Petersburg. See below! There are many other waterways in the city, but the most interesting and main ones are those crossing the central part of the city (the old town centre) and merging magnificently together, so the ones we've listed below. 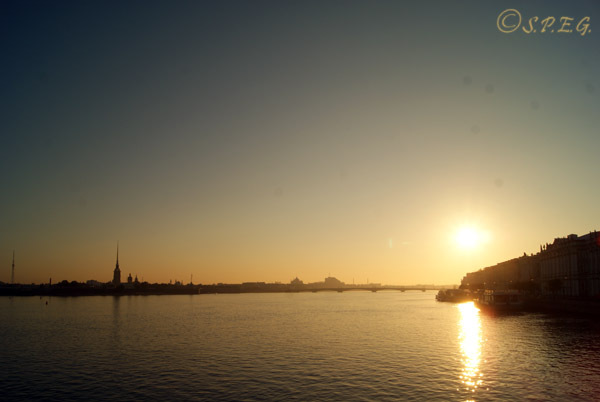 The Neva River in St. Petersbrug Russia during the Sunset. The Neva River, whose waters account for a tenth of the area of the city, is the most impressive waterway in St Petersburg. It is 74 km long (32 km in the city), 300 to 1200 metres wide and up to 24 meters deep. Considered the third largest river in Europe (after the Volga and the Danube), the Neva River, with its gorgeous draw bridges and adorned granite embankments, is undoubtedly an essential part of St Petersburg's charm. Metro: Admiralteyskaya, Sportivnaya, Ploshchad Lenina, Krestovsky Ostrov. Nearby: Voskresenskaya Naberezhnaya (Resurrection Embankment), Naberezhnaya Kutuzova (Kutuzov Embankment), Dvortsovaya Naberezhnaya (Palace Embankment), Admiralteiskaya Naberezhnaya (Admiralty Embankment), Angliskaya Naberezhnaya (English Embankment), Naberezhnaya Lomonosova (Lomonosov Embankment), Naberezhnaya Makarova (Makarova Embankment), Petrovskaya Naberezhnaya (Peters Quay). More info about the Neva River can be found Here. The Bolshaya Neva in St. Petersburg Russia. 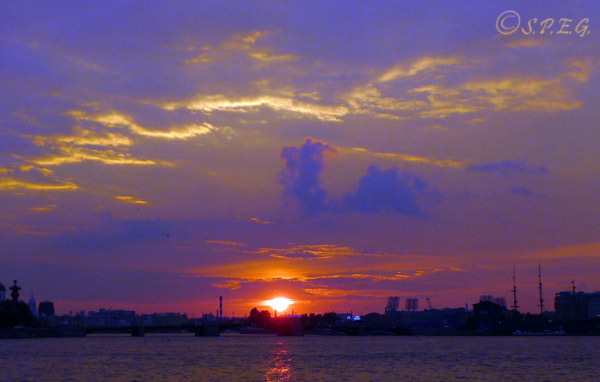 Bolshaya Neva is the largest armlet of the Neva River. It flows gracefully into the Neva Bay of the Gulf of Finland, in the area surrounded by Vasilievsky Island, Gutuevsky Island and Kanonersky Island. Bolshaya Neva river is 3.62 Km long, with a width that varies from 200 meters to 400 meters, while the depth ranges from 8.2 meters to 12.8 meters. Beautiful historic buildings embellish the river on both of its banks. The Malaya Neva in St. Petersburg Russia. The Malaya Neva crosses the famous Spit of Vasilievsky Island in the historic center of the city and flows into the Neva Bay between Dekabristov Island and Petrovsky Island. With a length of 4.3 Km and a width of 200-375 meters the Malaya Neva is considered the second largest branch of the Neva River. When travelling on this river by boat, watch out for the two following bridges: Exchange Bridge and Tuchkov Bridge, which span the Malaya Neva. The Fontanka River in St. Petersburg Russia. 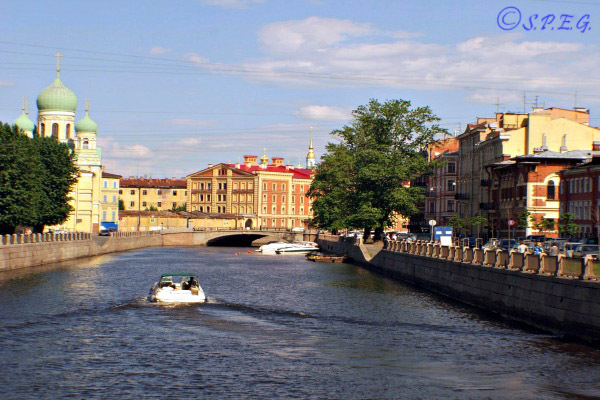 Running through the heart of St Petersburg, the Fontanka River is the busiest river among the city excursion boats. Its embankment is filled with elegant imperial residences and unaltered bridges which will certainly impress you. Originally, the Fontanka River, which is the left branch of the large Neva River, marked the edge of Saint Petersburg, although the city has since extended far beyond Fontanka's banks. Today, with a length of 6,700 meters, and a width up to 70 meters, it still plays an important role in the geography of the city. Metro: Gostiny Dvor, Dostoyevskaya, Sadovaya, Pushkinskaya, Teknologichesky Institut. Nearby: Neva River, Palace Embankment, Moyka River, Ulitsa Pestelya, Nevsky Prospekt, Gorokhovaya Ulitsa, Moskovsky Prospekt, Voznesensky Prospekt, Kryukov Canal, Lermontovsky Prospekt, Sadovaya Ulitsa, Prospekt Rimskogo-Korsakova, Griboedov Canal. The Moika River in St. Petersburg Russia. 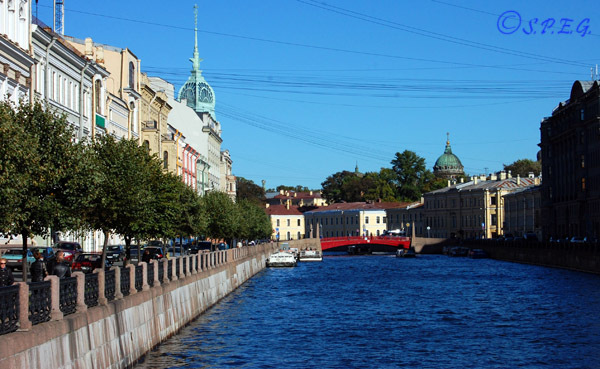 The Moika River is a small river (5 Km long and 40 meters wide) surrounding the central part of St. Petersburg. Famous for crossing the Blued Bridge, Petersburg's widest bridge at 97.3m, the river is an attraction itself. However, what makes this river interesting is that it is crossed by 15 bridges and lined with fascinating 18th century architecture, including the Stroganov and Yusopov Palaces, the New Holland Arch and the notable St. Micheal's Castle. Metro: Gostiny Dvor / Nevsky Prospekt, Sennaya Ploschad / Sadovaya, Admiralteyskaya. Nearby: Bolshaya Morskaya Ulitsa, Kryukov Canal, Voznesensky Prospekt, Gorokhovaya Ulitsa, Nevsky Prospekt, The Winter Canal, Field of Mars, Mikhailovsky Garden, Summer Garden, Mikhailovsky Palace, Palace Square, Lebyazhya Kanavka (Swan Canal), Sadovaya Ulitsa. The Griboedov Canal in St. Petersburg Russia. 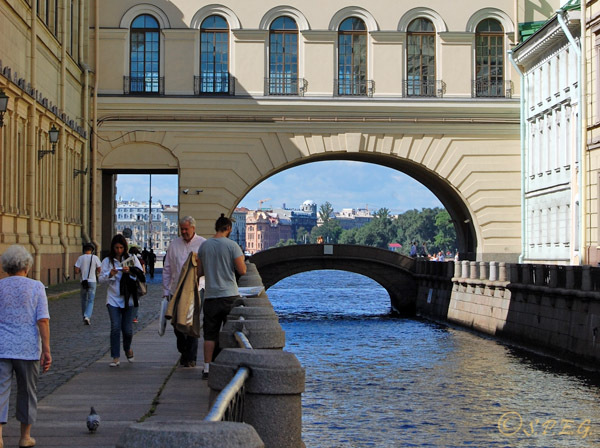 Known also as a street, the Griboedov Canal, stretching 5 km through the very center of the city of St. Petersburg is crossed by 21 decorative bridges, among which there is the popular Bank Bridge with the griffins. Compared to the other rivers and canals of St. Petersburg, this canal is the most picturesque and striking because of the historical buildings and churches lined along the banks, such as the famous Church on the Spilled Blood. So our advice is to take your camera with you and enjoy the view when you take this route as you will be cruising right along the city center. Nearby: Fontanka River, Moyka River, Sadovaya Ulitsa, Voznesensky Prospekt, Nevsky Prospekt, Mikhailovsky Garden, Field of Mars, Sennaya Ploshchad, Teatralnaya Ploshchad (Theatre Square), St. Petersburg State Conservatory, St. Nicholas Naval Cathedral. The Winter Canal in St. Petersburg Russia. The Winter Canal is one of the shortest and tiny canal in St Petersburg as well as one of the most romantic and picturesque spots of the city. Dug in 1719 and built a few years later by the eminent architect Giacomo Quarenghi, which he also built the three story building of the Hermitage theater on its right bank, the canal is only 228 metres long and 20 metres wide, and is connecting the Neva River and the Moyka in the area of the Winter Palace. This is the reason why locals they call it "The Hermitage Bridge or Winter Canal". Nearby: Hermitage Museum, Palace Square, Nevsky Prospekt, Hermitage Bridge. The Swan Canal in St. Petersburg Russia. The Swan Canal is one of the oldest canals in Russia as well as one of the oldest bridges in the city made of stone which was created by the famous architect Yury Felten. 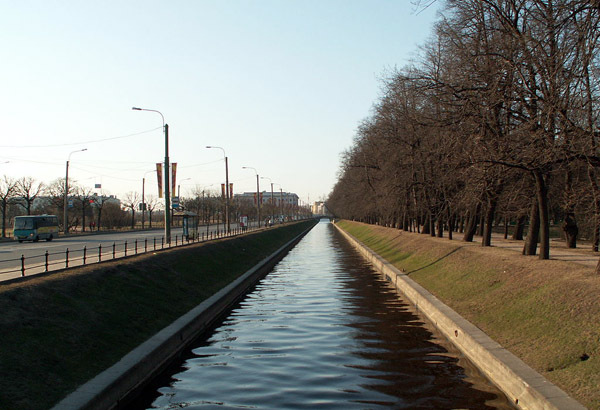 With a length of 648 meters the canal lead towards Mikhailovsky Castle and separates two of St. Petersburg's most famous green spaces - the Field of Mars and the Summer Garden. Throughout the 18th century, the Swan Canal was also deepened and strengthened several times, but granite supports fixing the banks of the canal were only attached in the middle of the 20th century. Today many boat tours cruise along this canal as it is centrally located so close to various interesting key sights. Nearby: Verkhne-Lebyazhny (Upper Swan) Bridge, Nizhny Lebyazhy (Lower Swan) Bridge, Mikhailovsky (Engineer's) Castle. The Kryukov Canal in St. Petersburg Russia. The historic Kryukov Canal is not so popular as it is the Griboedov Canal, the Moyka, and the Fontanka River, but it is important to mention because its granite embankments and old bridges are quite beautiful and second because many of St. Petersburg's most impressive attractions stand on its banks, such as New Holland, the Mariinsky Theatre, and the bell tower of St. Nicholas Naval Cathedral as you can see in the photo above. Originally dug from the Neva to the Moyka River between 1717-1720, the canal has a lenght of 1000 km and connects to the Griboedov Canal, the Moyka, and the Fontanka River - plus six bridges cross the canal. So when taking a boat tour and going through this route you will see a lot of bridges as well as a few interesting city attractions. Nearby: Gymnasium of the Imperial Philanthropic Societ, St. Nicholas Naval Cathedral, House of Baron Fitingof, Mariinsky Theatre, Smezhny Bridge, Staro-Nikolsky Bridge, Kashin Bridge, Torgovy Bridge, Decembrists Bridge, Matveev Bridge. 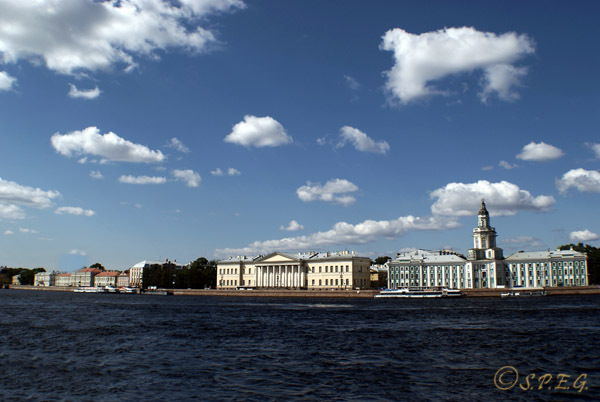 Would you like to cruise the rivers and canals of Saint Petersburg?